In recent times, there has been frequent leadership change in BMTC. It’s new Managing Director Anjum Parwez took charge only about two and half months back. Parwez, 43, is an IAS officer of ‘94 batch. What are your main observations about BMTC after taking charge? Our major challenge is cutting down the cost of operation, since ticket prices cannot be increased. How can operation costs be reduced? That is too complex, I cannot talk about it. These are internal matters. There are quite a few old ordinary buses in BMTC. But of late, there are the more suave ordinary red buses. Will the old buses be replaced by the new red ones soon? There are almost 600 old buses that have travelled over 7.5 lakh kms. These are all ordinary buses, maybe 6-8 years old. The average life of a bus is 7.5 lakh kms, which these buses have crossed. We have to phase these out – one, because they are not very commuter-friendly, second because their maintenance cost is high as they break down often. By July end 2013, these 600 buses will be phased out, and replaced by the ordinary red buses from Ashok Leyland. These include buses in both core areas and suburbs. We will replace the core area buses with Euro IV buses; they have 2×2 seats and are low-floor. These are the buses with BS-IV written on them. In suburbs we will replace with BS III buses. What would be the cost of these buses? Overall, 900 new ordinary buses (inclusive of replacing the 600 old buses) and 150 luxury buses will be bought by July 2013. The luxury buses could be of Volvo, Mercedes or Corona make; we are still deciding on that. The cost of an ordinary bus is around Rs 30 lakh, and that of a luxury bus is Rs 80 lakh. So overall, some 400 cr Rs will be needed. We usually take loans from commercial banks and repay them over the long term. What is the percentage of luxury and ordinary buses in BMTC? The buying ratio is 20:80 for AC and non-AC buses. This is the standard pattern, and we try to maintain it. In Bangalore, the preference for AC buses is higher. The demand for Volvo is increasing day-by-day. So the percentage of volvos can be more than 20% at a later time. Is BMTC focusing more on improving Volvos services rather than ordinary buses? We have two points of view – one is to give better service, the other is to be economically viable. AC buses are more economically viable than non-AC buses. We measure profit considering Cost Per KM (CPKM) and Earning Per KM (EPKM). The gap between both is our profit margin. This profit margin is higher for AC buses. For these buses, the CPKM is Rs 51-52, and the EPKM is Rs 52-53. There is a marginal profit of Rs 1. For ordinary buses, both CPKM and EPKM is Rs 31-33; there is no profit. The cost of running Volvos is high; they give mileage of only 2.2 km per litre. An ordinary bus gives 4 km per litre. But this cost of Volvos is covered by their high pricing. So overall, Volvos make profit; but all that is eaten up by ordinary buses for maintenance. As a Corporation our target is not to make profit, but to enhance services without going into loss. Our focus is everywhere. AC buses are used only by middle and upper middle class people. So our focus is to improve services, frequency etc in all buses. Many parts of the city is still not covered by Volvo. Volvos are mostly concentrated in the IT corridor. A Volvo can be viable only if it has at least 40% occupancy. We do surveys and analyses to check viability. If there is no volume, within a month our losses would be so high that we cannot continue that service. We can take chances with ordinary buses as their running cost is less, but not with Volvos. We have tried introducing Volvos in many routes, but we pulled them out when they did not work. So we are focusing on sectors that will actually use Volvos. I have told each depot to identify at least 5-6 new schedules for Volvos; we will try introducing them in these routes. So are Volvos going to be concentrated in affluent areas of the city, mainly the IT corridor? My commitment is to normal bus services. Volvo is a value-added service, and can be provided only where it is viable. It can’t be provided in all nooks and corners. We can run normal buses even if they make loss. I travel in Volvo buses, and I’m seeing a change in the profile of the people who are using it. It is becoming popular among lower middle class also. I feel that the demand for luxury bus is going to increase, and that it may even become a norm later. Initially when Volvos started, it took 3-4 years for it to start doing well. You mentioned studies on viability. How exactly are these done? We hire consultants to do the study. They study how many people are travelling, where are they getting in and out, peak hour traffic etc in different points. When we introduce a bus in a new route, we check the volume of passengers. If we have good number of passengers in a new bus, our EPKM will be high, and we will introduce another bus in that route. As we keep increasing the number of buses, the passenger volume and EPKM will reach a peak point. If we introduce buses after this, there will be loss. So the target is to identify this peak point. It’s all mathematics. Until we reach the peak point, we can introduce new buses for a route. We are doing these studies meticulously now – we have started with Volvos, and will extend this to other buses later. We have decided that no new Volvos should be introduced without studying the existing schedule. As for introducing new routes, we first do trials and decide based on that. Any plans for route rationalisation? For instance, In, Chennai MTC has around 800 routes compared to BMTC’s 2300+ routes. The international organisation EMBARQ is doing a study on this in two routes – one from KBS to Dairy Circle, and another from KBS to Electronic City. These two were selected as they were high density routes. We don’t know if the study will recommend increasing or decreasing the number of routes. The idea is to be efficient while reducing travelling time. What is BMTC doing to improve last mile connectivity? Any more Big Connect services? We have more routes so as to ensure last mile connectivity. BMTC buses cannot come to people’s doorsteps. People have to go to the depot and use them. We will think of Big Connect buses further only for Metro. 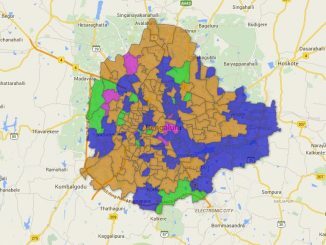 We have already covered up to the last boundaries of BBMP. What is the profit that chartered services make? It is said that because of allocation buses for these services, there are fewer buses for general public in peak hours. Chartered services are profitable for BMTC because there is volume. It’s not that the buses are taken off their routes; the buses will go to companies only in particular timings and then come back to routine services. If we don’t give these buses, there will be more private buses on the road. Our annual revenue from chartered services is Rs 50 cr, while the overall revenue is Rs 1550 cr. We are planning more tie-ups with companies as there is demand; in 2013-14, we have a target of earning Rs 80 cr from chartered services. We have a fleet of 6400 buses. So there can be no shortage because of chartered services. Scheduling is done in such a way that routine services are not affected. Trunk routes, especially, have very high bus frequency. But could there be other contributing factors to the shortage during peak hours? There is 8-10% of trip cancellations daily because of two factors – traffic congestion and bus breakdown. If a bus gets delayed for too long because of congestion, we may cancel the next trip. If it is a delay of 15-20 minutes only, we do not do this. In case of breakdowns also, trips are cancelled. Can you explain the rationale for the recent ticket price hike? Before the price hike, we had deficit of about Rs 280 cr. This was due to the diesel price, the recent employee salary hike; there is also a annual increase of 10-15% in the cost of spare parts of buses. After the ticket price hike, we have covered about Rs 150 cr. We plan to cover the remaining deficit by improving our own efficiency, by increasing KMPL (mileage), reducing breakdowns etc. There is lot of revenue loss because of tickets not being taken in buses. Does BMTC have an estimate of the revenue loss because of this? The amount is very difficult to estimate. We have a strong line checking system wherein inspectors check for tickets. We are also sending some senior officers regularly to do this. There is not much excitement around Bus Day now. Have you done any studies, user survey/feedback relating to Bus Day, or have any further plans with it? We are still doing Bus Day the same way as earlier. Some special buses are introduced on the day. Bus Day is more of an awareness programme, of going to people and telling them that travel by buses is more pleasant than by their private vehicles. The idea is only bring people to buses for the experience. No studies have been done. We will start a new website for dynamic survey by December or mid-January. Public can put their feedback and requirements in the site as and when they travel. As opposed to the current method of public sending requests in written form, they can send it online. Tracking buses real time will also be introduced gradually; this will take time – 750 buses will be tracked through GPS. These buses will have ETM (Electronic Ticket Machines) also. This is all part of the ITS (Intelligent Transport Solution) system. Public will be able to track the shortest route, least expensive route etc, using this. The purple moorhen eats a variety of food, of both plant and animal origin. This shimmering purple beauty is great fun to watch! Going on a heritage walk can throw up some delightful insights into Bengaluru’s history.